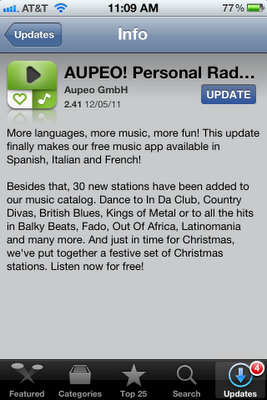 For those of you not familiar with AUPEO! Personal Radio it is an internet radio for iOS that is compatible with Pioneer's AppRadio. You basically choose a genre and it plays music... it's that simple. But there are moods that you can set which will fine tune the music that's played. A lot more and a really nice looking AppRadio interface. The app just got an update from it's developers in the iOS App Store. The update adds support for Spanish, Italian and French. It also adds 30 new stations to the catalog. So if you haven't already go get it in the app store. Happy updating!